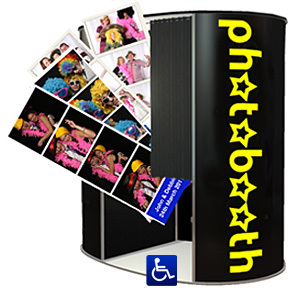 Photo Booth Hire from £199 in Harrogate for Parties, Wedding Receptions, Proms and Events. Photo Booth Hire in Harrogate for Wedding Receptions, Parties, Proms and Events. From our regional depots in Leeds, Manchester and Nottingham we provide photo booth hire for wedding receptions, parties, proms, Christmas parties and events in Harrogate and throughout the UK. Recent parties include Rudding Park, the Old Swan Hotel and the Sun Pavilion. A recent wedding for Emily and Chris at Victoria Hall, Saltaire saw our booth in full swing. With over 150 guests we had a constant stream of party guests queueing to be stars in our fun photo booth. Quite a few of the guests had seen our booth at other parties in the area and had arrived with a plan to get the best pictures. We hope to be seeing them all again very soon. Photobooth hire packages available in Harrogate.